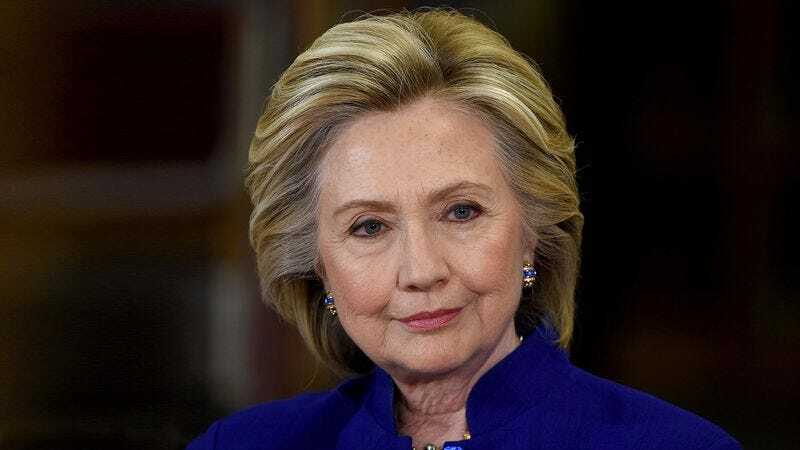 NEW YORK—Having grossly miscalculated the resources required for an 18-month presidential bid, Democratic frontrunner Hillary Clinton announced Tuesday she had ended her race for the White House after blowing through $2 billion of campaign funds in a single month. “Admittedly, my staff and I haven’t kept a close enough eye on our financials over the past few weeks, and certain of our expenditures, such as the 800,000-square-foot Hillary For America headquarters we broke ground on in Des Moines and those seven backup campaign buses, appear to have been poor decisions,” said Clinton, who faulted several crucial missteps, including the licensing of every song in the Fleetwood Mac catalogue for her campaign appearances and sending two pounds of direct-mail solicitations each day to every man, woman, and child in the nation. “While it seemed a winning strategy at first, buying up all the primetime commercial blocks on every network affiliate in all 50 states was probably ill-advised, as was hiring our 3,000-member campaign team in Puerto Rico, which does not have any electoral votes.” The former secretary of state went on to say she was confident the lessons she had learned from her mistakes this time around would only make her a stronger candidate in 2020.